Curt, Sue and Curtis McPherson keep Hi Tech Precision running and humming. LA VERNE, California, October 13, 2017 — On a back-to-work Monday on Oct. 9, a lot of people might have missed the Space Exploration Technologies Corp.’s (Space X) successful launch of a Falcon 9 rocket out of Vandenberg Air Force Base, but not the McPherson family, which owns and operates Hi Tech Precision in La Verne. Like the engineers in “Hidden Figures” — the Academy Award-nominated film about the brilliant minds who helped launch astronaut John Glenn into orbit — Curt, his wife Susan and their son Curtis anxiously huddled around an office computer to watch, knowing that one of their pressure-tested machined parts, meeting specs down to the millionth of an inch, was riding on that rocket ship. “We celebrated because we didn’t destroy a $1 billion rocket,” Curt said. Besides playing a small, but not insignificant, role in the successful Space X launch, Hi Tech Precision, a CNC (Computerized Numerical Control) machine shop, has had many other opportunities to celebrate. Their parts and products have also been found in deep space (the Mars Rover), at the bottom of the North Sea and in everyday products critical to the success of the military, aerospace, automotive, oil and gas and commercial industries. The Hi Tech Precision crew is primed, pumped and ready to serve a diverse customer base. That Hi Tech precision has become a critical part of so many projects is all the more remarkable given the genesis of the company. When Curt’s parents were going through a divorce, his L.A. County firefighter dad told his then 15-year-old son he would have to get a job to help make ends meet. “Go see this man about a job,” he said, handing him a machine shop owner’s business card. Curt was hired and worked at the shop part-time his sophomore and junior years and full-time his senior year after school, from 3 p.m. to 11:30 p.m. 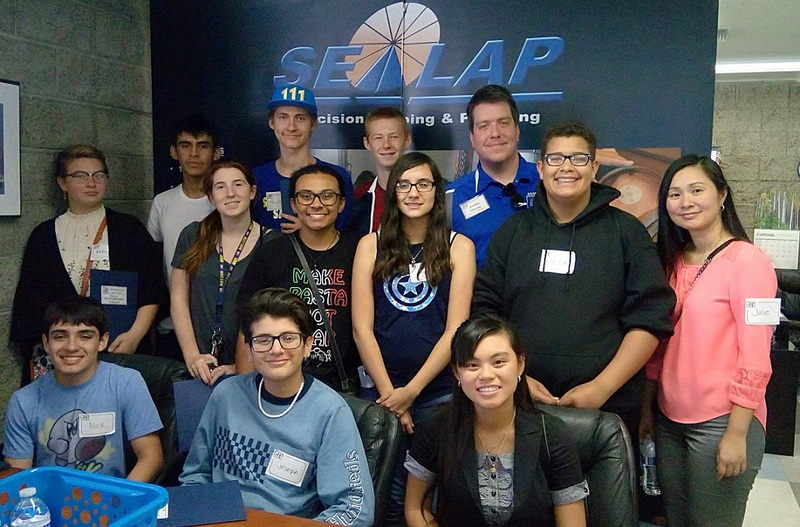 While his fellow students were taking their SATs in preparation for college, Curt was running seven machines, inspecting their parts, maintaining their oil levels, and making the proper calibrations. Emboldened by his experience, Curt asked for a salary increase from $1.50 an hour to $1.75 an hour, and got it. But when he came back months later and asked for another bump in pay to $1.85 hour, he was turned down. “So I quit that job over 10 cents an hour,” he said laughing. Curt moved from shop to shop, including one shop that made folding trick quarters “that would magically go through the mouth of a soda bottle and land inside, intact.” At every stop, he became a more experienced machinist and a more ardent advocate of the manufacturing process. As CNC (Computerized Numerical Control) machines became more affordable and began to dominate machine shop floors, Curt learned how to program them. The instructions he would code into them telling them where to move, where to cut, how deep, etc., became, in effect, his second language. Finally, in 1994, he bought his first machine, a manual Bridgeport Mill, and went into business for himself. The next year, he bought a small machining business in Covina. 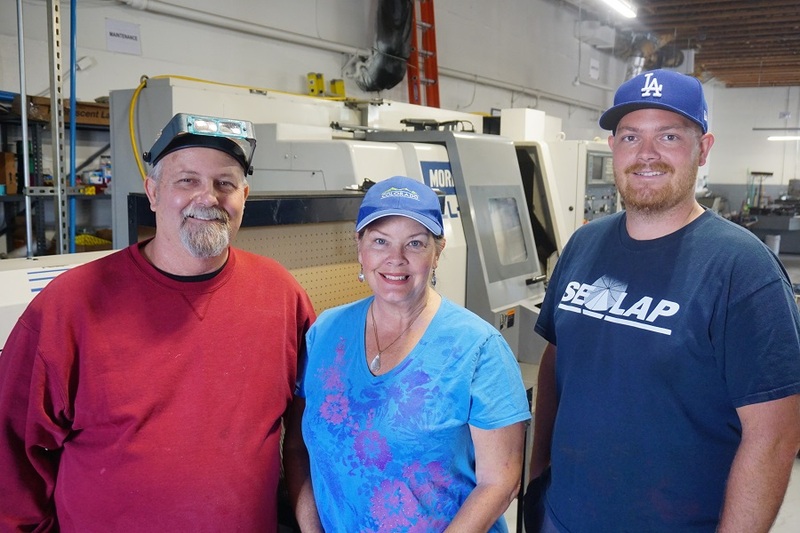 Then in 2014, Curt and Sue were able to realize a lifelong dream and move their business to La Verne, where they live, by purchasing and renovating the building at 2100 Arrow Hwy., which over its 80-year history had been home to a lumber yard, cabinet shop, carpet company, construction firm and several other uses including batting machines for the University of La Verne softball and baseball programs. “We closed escrow two-and-a-half years ago on April 15, and it took us six months to renovate,” he said. It might have taken longer were it not for the help of nephews, nieces, sisters-in-law, and friends. “We had a big painting party, and went out later and had a toast,” Curt said. Today, Hi Tech Precision is a well-oiled CNC machine filled with CNC lathes and CNC mills (which are programmed and controlled by computers) along with assorted drill presses, grinders, indexing heads, vices and deburring equipment. Hi Tech Precision also boasts a full in-house lapping shop, a machine process in which two surfaces are rubbed together to create an interface that will not leak when great pressure is applied, a critical concern in the aerospace industry. At its core, Hi Tech Precision takes unfinished blocks or billets of materials, made of various metals, and turns them into useful functioning parts or prototypes. Essentially, that’s the magic of manufacturing that has so enthralled Curt over the years. Give him or his team a set of blueprints and he’ll turn a design into 500 or 5 million widgets. As a commercial CNC contract shop, Hi Tech Precision has learned to be versatile. Recent projects have including making parts for camera dollies used on film shoots, automatic inflation systems for tires on military vehicles, metal scratchers for lottery tickets, containers to breed botox, and a paintball type gun ordered by a correctional facility (if you can believe it) that fires rubberized golf balls at prisoners that refuse to leave their cells. Over the years, acting in his customers’ best interests, Curt has cautioned companies, gung-ho to produce a million parts on the belief they are going to strike it rich, to perhaps scale back their orders until they have fully tested their concept in the marketplace. “That way they’re not stuck with a lot of inventory,” he said. 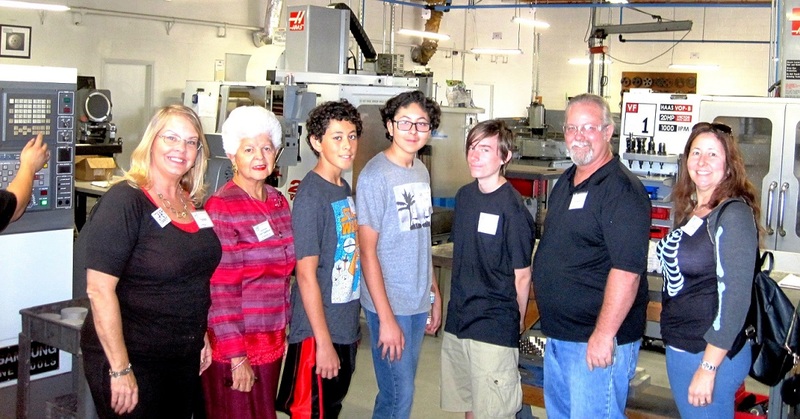 For National Manufacturing Day, Congresswoman Grace Napolitano, second from left, knew that Hi Tech Precision was the place to be. Another reason for Hi Tech Precision’s continued growth is its ongoing outreach to the community. The company annually participates in National Manufacturing Day, held the first Friday of every October. “By opening up our shop floor, we’re able to showcase modern manufacturing for what it is — a sleek, technology-driven industry that offers secure, good-paying jobs,” Susan said. “You don’t see oil on the ground here. And the jobs will be waiting, according to Susan. Over the next decade, nearly 3.4 million manufacturing jobs will need to be filled, but of that total, 2 million jobs will go unfilled. That skills gap will put America at greater risk. Already, for example, China has overtaken the United States as the world’s largest manufacturer. In 2014, the average manufacturing worker earned $79,553 annually, including pay and benefits. Hi Tech Precision attracted a young crowd of future machinists on National Manufacturing Day. For the foreseeable future, Hi Tech Precision will aim to continue to diversity its range of customers, making it less susceptible to the vagaries of the economic cycle. 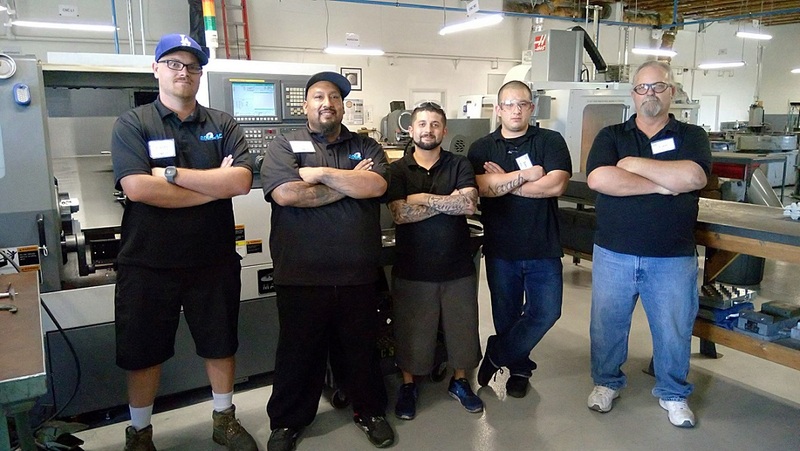 While Curt and Susan continue to build the business, Curtis, a Bonita High School graduate and former Jazz Band member, will continue adding to his responsibilities, which already includes running Hi Tech Precision’s lapping operation. The company also has set its sights on earning its AS9100 aerospace designation, which will allow it compete for more aerospace business. And through it all, they expect to keep their high standards, delivering on quality, time and price. They also want to maintain their sense of humor. With Curt and family at the controls, Hi Tech Precision will be delivering smooth landings for years to come. Everybody in La Verne is growing sweet on Nothing Bundt Cakes, where you can indulge your cravings for delicious cakes made from only the finest and freshest ingredients that spell perfection every time. Nothing Bundt Cakes is located in the Stater Bros. Shopping Center at 2084 Foothill Blvd., Suite H, in La Verne. The holidays are here, so call 909.392.2253 or email laverne@nothingbundtcake.com so you won’t miss out! Great article! I enjoyed reading about Hi Tech Precision and admire the job they’re doing with the youth of La Verne. We are going to need more skilled machinists in the future and hopefully avoid work going to China. Let’s take care of our own.